I’ve searched and read a few of threads on which pads to use but haven’t seen much on the differences between pads. The stock foam pad, is that an actual polishing pad or just the backer? I purchased several different types of bonnets; microfiber terry cloth, etc. The packages all say foam is the best but I was unable to find additional foam bonnets. What do you use on your 7424 for polishing? Take the stock pad (included in the box) and throw it away. Don't touch your paint with it. Buff and Shine, orange/black microfiber for extra heavy cutting. I also really like the Lake Country Hydrotech line. I’ve searched and read a few of threads on which pads to use but haven’t seen much on the differences between pads. 1: What's the difference between the types of foam pads as in foam cutting, foam polishing, foam finishing and foam waxing? 2: What's the difference between Lake Country, Buff and Shine, Meguiar's, Griot's, Adams, 3D, Chemical Guys, etc. pads? The first question is easy, you have a scale of aggressiveness or ABRASIVENES from the most to the least. For example a foam cutting pad will be a LOT more aggressive than a foam waxing pad. The actual FOAM can be altered by adding different chemicals to the foam to enhance certain characteristics. Assuming, (and I hate to assume), but since you didn't say, assuming you want the right pads to buff out a neglected car, then you'll need at a minimum some foam cutting pads and some foam polishing pads. You can tackle just about any project with just these two pads. It's nice to also have some foam finishing pads in case the paint you're working on is soft and mars easy but in most cases a foam "polishing" pad will finish out on most paints. What's more important is the STUFF touching the paint and that's the compounds, polishes and cleaner/waxes. It is these things that have ABRASIVES in them and it is the abrasives that TOUCH the paint first, not the foam. If you use junk for products you'll get junk for results. The pads are no where near as important as the abrasive technology as long as you match the type of pad to the process you're performing. If you ask 10 detailers or just detailing enthusiasts, what is the most important thing when it comes to polishing paint, easily 50% of the people you ask will say TECHNIQUE. And they are all wrong. The stock foam pad, is that an actual polishing pad or just the backer? Wet pads don't buff good. Thick pads on free spinning tools don't rotate well. Thick wet pads don't rotate at all. I purchased several different types of bonnets; microfiber terry cloth, etc. The packages all say foam is the best but I was unable to find additional foam bonnets. 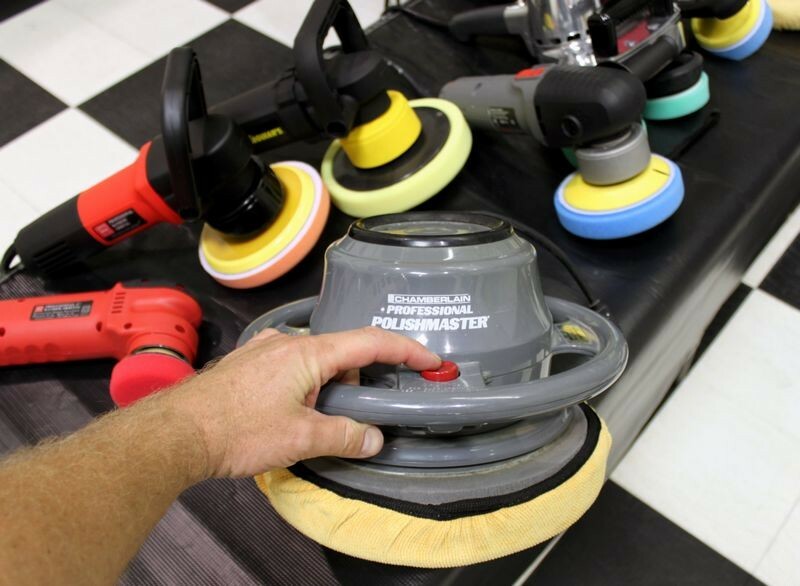 What do you use on your 7424 for polishing? I can see you're new to using a Porter Cable. In the old days people used a polisher like the one you see below and when using it they used a variety of different BONNETS on the foam backing pad. The foam backing pads was NOT used to actually buff on paint but as the interface that held the bonnet. ut note all the polishers behind it have foam buffing pads on the backing plate but no bonnets on them. 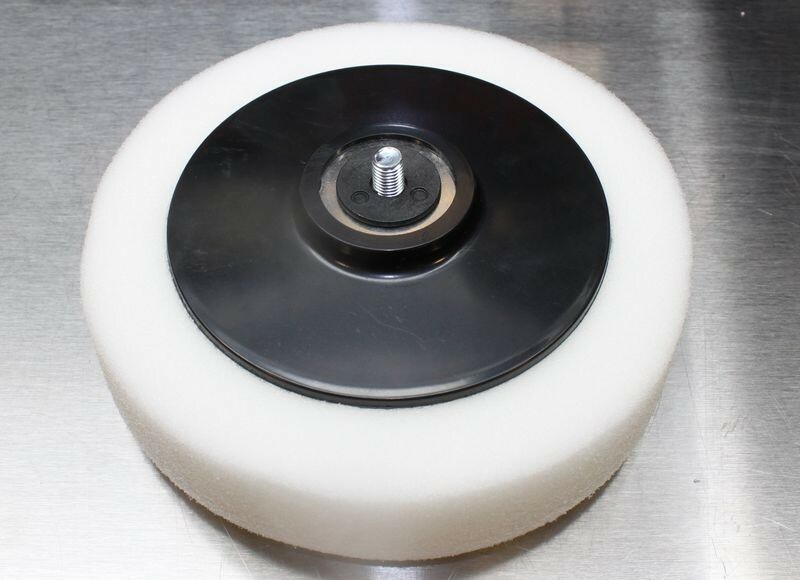 What you want to do with your Porter Cable random orbital polisher is to get some simple flat faced foam buffing pads. Tell me what you're working on and what you're trying to do and I'll do my best to help you to get the right pads. What you DON'T want to do is try to buff out a car using bonnets on the Porter Cable polisher. It's not going to work. Thank you for the response. I've watched so many videos over the past week that I thought I had pieced together a decent plan for what started out as 'hey, I should ceramic coat my truck, boat and new RV!' When I was younger I loved detailing my car, hell, who didn't when they were 16 years old with a new old car!? Now I'm 50 and wow, I didn't even know what claying was! So, I know enough about forums to try and not drop in as a new member and throw down a giant turd of a thread, but that's exactly what I did! Sorry about that. I've watched several hours of video, in a nut shell, I've gleaned that I need to wash the vehicles really well. This has dovetailed into soaps, degreasers, wash bucket, rinse bucket, top down washing, etc. Got it, I've had fun doing that all week learning the 'new' process. The next step is claying, I'm pretty comfortable with this, the weather has been crap so I'm waiting this out as I'll just have to start over washing. After claying I'm prepping for the polish. These are new vehicles, the paints are all in really good shape. I ordered the PC 7424xp and thought, oh, just grab a few 'pads' and in a week or two I'll be ready to dive in. That's where this post came in. I got the polisher yesterday and went to find pads for it only to realize I had no idea what all I needed. I just assumed it came with the backer. After reading the first few responses in here I've ordered the 5" backer plate with hook and loop and a variety of Lake Country CCS pads. I appreciate the responses, thanks for taking the time! 3. LSP: I use the Black/Red/Gold (have all 3). I like the Red of the 3 the best. But can't go wrong with any of these 3. As for the 5" It will do the job! Let us know how things went and KEEP ON ROCKING! Microfiber Cutting pads VS polishing/finishing pads, any difference? Can polishing pads be put in the fridge like paint roller pads? Why do polishing pads last longer than cutting pads?